The municipalities of Imereti fail to provide public information within the time frames established by law, and the information they provide is often incomplete. TI Georgia often relies on information provided by municipalities when preparing studies and articles. We have faced problems in this regard on several occasions in the case of the municipalities of Imereti. In September 2018, with the aim of monitoring the process of provision of public information, our organization requested public information from the city/town halls and city/town councils of the municipalities of the Imereti region. The information concerned staff lists, remuneration, and budget funds spent on business trips, fuel, and means of communication. 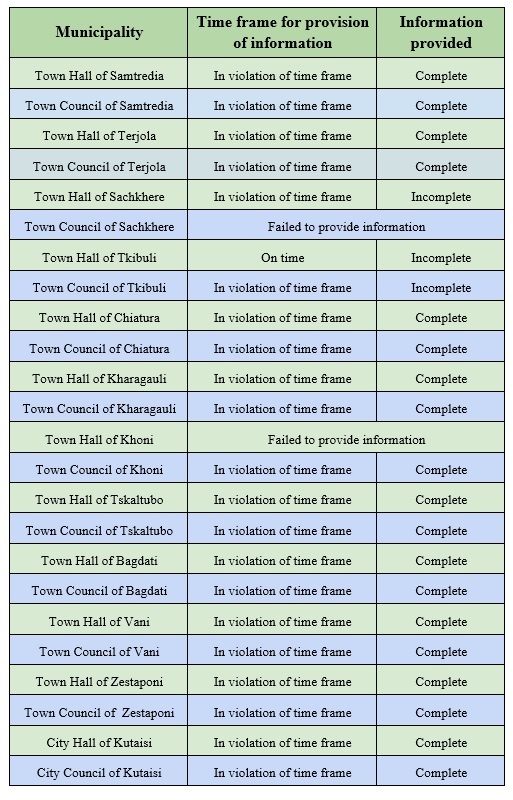 ● All the municipal councils violated the statutory time frames for the provision of information. ● Ensure proactive publication of public information on the official websites.